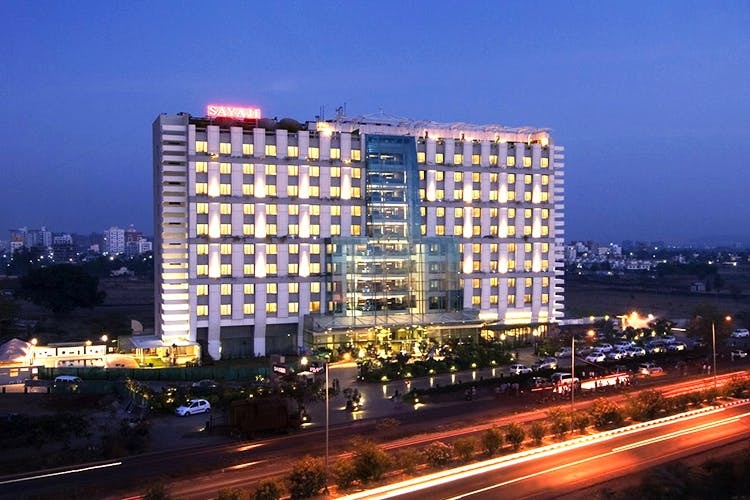 Sayaji Hotel in Wakad, on the outskirts of Pune offers 4-star accommodation for both leisure and business travellers. Whether you’re looking for a fancy weekend getaway, or planning a large-scale event; Sayaji will accommodate your every need. Rooms are spacious, and offered in two categories – Grand Rooms, and Suites. All the rooms feature modern aesthetics, with hi-tech features (satellite TV, an iPod dock), comfortable space for lounging, an en-suite bathroom, personal safe, and minibar. The hotel has its own indoor fitness centre, outdoor pool, spa and wellness centre, business centre, and banqueting facilities. For private or corporate events, they also have a professional ‘events’ team that will help you score the best deals within your budget. There are three dining options you can choose from, namely – Turque, Portico, and Barbeque Nation. Turque offers al fresco pool-side as well as indoor dining, with a multi-cuisine menu; Portico features classic Indian dishes, crowd favourites, and a bit of Oriental and Continental cuisine as well. Barbeque Nation of course, needs no introduction – their ‘grillicious’ offerings are tempting to both vegetarian and non-vegetarian diners, and are a must-try. The hotel provides free WiFi to guests, and has a tour desk which can help you arrange sightseeing trips to the local attractions (if you’re new to the city). There is also a Bar on-site, which we think would make a great spot to wind down after a long day.